This last week has been filled with cookie dough. Every year I give away collections of homemade goodies to school staff, the church office, work places, my elderly friend in the nursing home as well as relatives. These days, people are thrilled to receive homemade goodies; it seems few have the time or energy to bake anymore, plus those delectables are bad for the diet. My teenager can barely stand to boil water for her Kraft macaroni and cheese, but her little sister enjoys helping me cook and bake. It is a wonderful bonding experience as well as a way to teach math and show the practical benefits of knowing how to read and follow directions. Making Auntie K’s well-loved gingerbread cookies is a particularly good experience. For this gingerbread recipe, developed by a chemistry teacher, a baking soda and water solution is added to a batter that has vinegar mixed into it. This combination causes the batter to bubble up as the soda-water is added, so the recipe is fun to make as well as delicious. My daughter enjoys the measuring of ingredients and I ask her questions like, “What does the baking soda do?” and “If we wanted to cut the recipe in half, how much molasses would we use?” or this year, “What percentage of one cup is one-third cup?” Oh, her teacher would be proud of me! I would encourage all parents to allow their kids a chance to bake homemade cookies for the holidays (from scratch, not the slice-and-bake kind) because making the “old-fashioned” kind of cookies provides a fun and delicious learning experience as well as a way to make lasting memories. So start a holiday tradition of baking together, if you haven’t already. 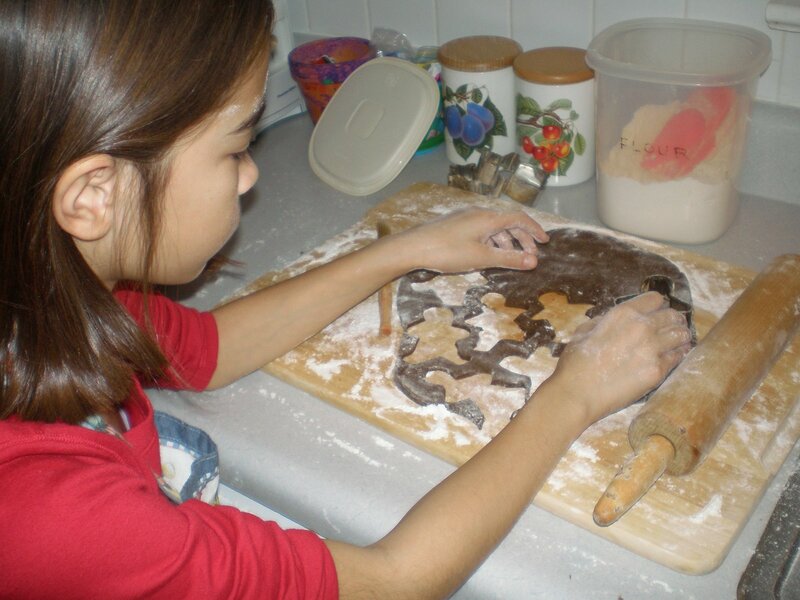 Don’t let the mess get in the way of the fun, and allow your child to be creative if your cookies need decorating. * May your baking memories be of warm delicious smells and warm loving hearts! This entry was posted in holiday, raising kids, recipe, traditions and tagged Christmas. Bookmark the permalink.